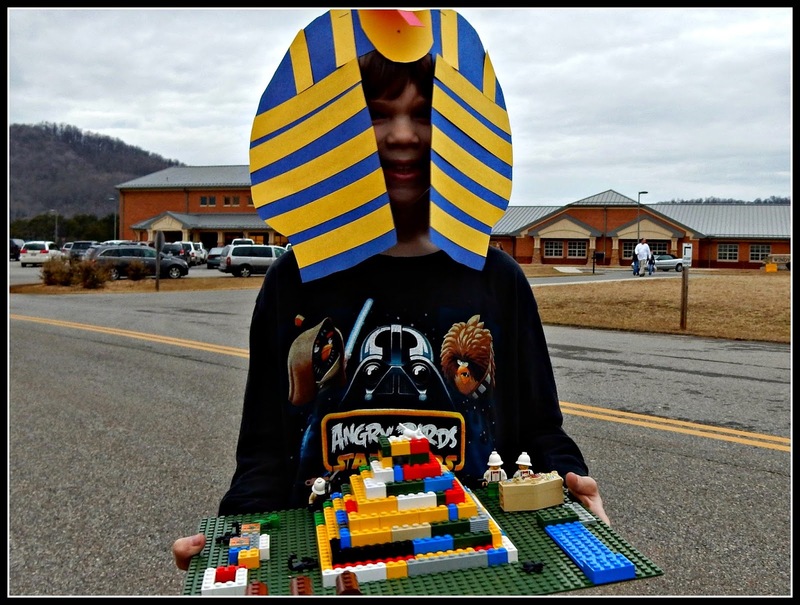 Here's a picture of Pierce, with the pyramid he built for an Egyptian unit he did at school. 1. My boys love the movie Big Hero 6. LOVE. I confess it's pretty cute. They quote it all day long. 2. I currently have an obsession with horseradish. I really hated it when I was younger. Now I'm putting it on every sandwich. Guess my taste buds have changed. 3. Reid wants to try eating snake (he is specifically interested in boa constrictor) and alligator. We actually found a Cajun restaurant here that offers alligator. But I don't think there's any snake to be found in town. Too bad we're not in Texas - I could totally hook him up with some rattlesnake (which, when I tried it, tasted a lot like scallops). 4. The other night I got into bed and things felt very....sandy. Turns out one of the boys had gotten into my bed for some reason after playing in the sandbox. Not a pleasant feeling. I had to change the sheets. 5. Pierce has started collecting watches. One day he tried to wear 8 watches to school. He looked like one of those guys that stands on the street corner selling watches. We've limited him to only wearing 2 to school from here on out. Linking with Tanya and Nancy today. I developed a love of horseradish a few years ago; it does great things on sandwiches, but it can really perk up potato salad as well! I'd probably wear 8 watches if I could get away wit it....OHHH, the new Apple watch will be out April 24th. Must have. I know sand in your bed wasn't fun, but it is kinda funny too! He did a good job on his pyramid. Guess what, I collect watches too, but only wear one at a time..lol Snake, no thanks; alligator, maybe! Have a blessed day. Good job, Pierce! Ix-nay on the horseradish...that stuff is too stout for me. I wish you and yours a wonderful Easter weekend! Never a dull moment with such innovative boys around! Horseradish is a marvelous flavor, in small doses! I love watches too - but only wear one at a time. Happy weekend - Easter blessings to you all. such a cutie! love his watch obsession. i used to have cheap watches that i wore like jewelry, switching out for whatever i was wearing that day. never more than one at a time, however. I giggled about the watches! I love horseradish and I'm now hooked on Trader Joe's Wasabi Mayo ... not quite the same, but will clean the sinuses! ;) I'm not interested in eating snake or alligator (and I live in TX). Happy Easter! I like some things that I didn't like as a kid. I love avocados and crushed red pepper now. That picture is so cute! What a fun Lego assignment. I've never had snack or alligator. I'd try them if it were in front of me. Your household is very entertaining. Love the watch story and Pierce wanting to try snake. I bet he's lots of fun to be around. Good job on the Pyramid! Loved your randoms - there's never a dull moment at your house, is there? I never have been able to eat horseradish. That is hilarious about wearing all those watches! Tell him for me that he looks just like a Pharaoh in this picture. That is a very good pyramid. You have done such a good job of getting them to taste different things! Our son was just the opposite; a picky eater. Is Big Hero 6 a movie? Gosh, I have all these grandkids, but I never heard of it. Wishing you all a wonderful Easter! The bunny bowl that you like-I got it for $3.99 at The Home Goods Store. Also the blue mug. Your kids are adorable! Love the antics you are telling about. They sound active, healthy and smart! Sandy sheet....yuk! :-) Have a very Blessed Easter! Awesome pyramid! I haven't seen Big Hero 6 yet but hope to watch it soon on DVD. I love horseradish sauce. Can't wait to have it with Prime Rib on Sunday. I love it with leftover cold meat, that's my favorite. I agree, two watches are plenty. I love watches and have about 4 working ones right now that I use. I also have others that I love but are not working. I have no desire to eat snake or alligator! Coleen wants to see Big Hero. If it's playing next week during her spring break I'll take her. Sand in the bed...not fun. We often have cat litter off the cats feet in our bed, also not fun. I love Horseradish. Had a roast beef wrap with horse radish this week and it was tasty. I've always heard Rattlesnake taste like "chicken" never, scallops though. You can possibly order canned snake. I didn't care for it. The horseradish has been a favorite with roast, burgers and even to beef up a gravy. Your boys sound so interesting and creative. I always enjoy your posts about them. No snake here either. But, gator tail is so good if you like chicken. Have a blessed Easter, Lisa. I like his headdress. Looks like Ramses the Great. I don't know if my comment went through. Just wanted to say that Pierce has style! And I have grown to like horseradish since I tried a roast beef sandwich with it at a local cafe. Stopping by to say Happy Easter to you and your family! My favorite lately is yummy horseradish mayo--especially with a roastbeef sandwhich... Eight watches is so funny--I just love kids at this age. Their imaginations are the best!!! Mattie loves big hero 6. It's all she talks about. Hope you and your family are well.